Rags and cloths soaked with solvents, thinners, linseed oil, combustible adhesives and other flammable liquids present a serious risk of fire when improperly discarded. 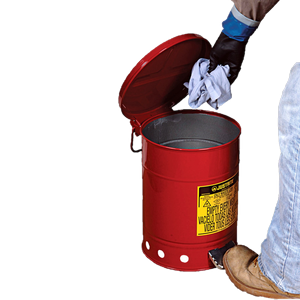 For this purpose, it is necessary to use Justrite® Steel Waste Safety Cans. The specially designed lid opens at an angle up to max. 60 degrees and stays closed when not in use. This isolates contents from fire sources and limits oxygen flow inside the can, so that spontaneous combustion risk is virtually eliminated. The heavy duty and high-grade coated steel is treated with a robust powder coat paint finish withstanding and protecting against rough handling. The galvanized 0.5 mm steel is resistant to gasoline, diesel, kerosene and a variety of other chemicals (see Chemical Resistance List). 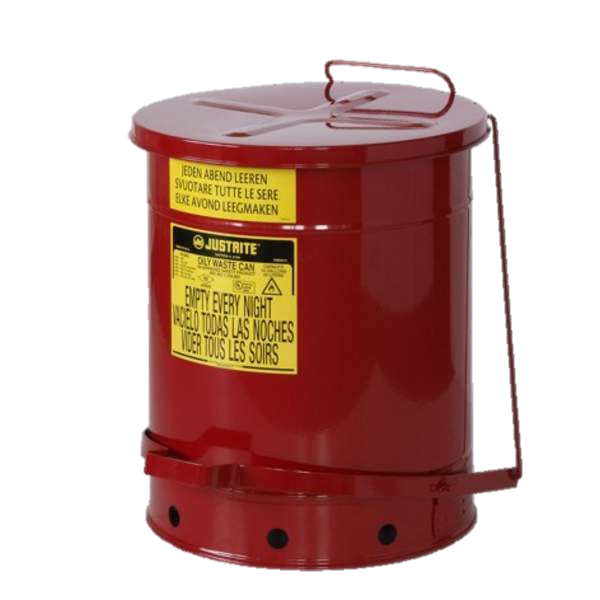 Justrite® Steel Waste Safety Cans are equipped with stiffening ribs on the sidewalls offering an additional bumper protection in tough conditions. Thanks to the 90 mm raised bottom, the safety can is protected against possible damage when placed on uneven surfaces. The elevated bottom also helps to grip the safety container with the hand during pouring operations. The elevated bottom allows air to circulate around the can to reduce moisture build-up and rusting.